Without rehashing all of my gushing compliments of Adichie, I will simply say this: Adichie is a woman worthy of admiration. She is strong, she is outspoken, she is proud, she is intelligent. And she’s a great writer. Since reading Americanah last year, I have been meaning to read more of her work. And I FINALLY got around to doing so. Because I love short stories, I decided to give her collection The Thing Around Your Neck a go. The longest story is only about twenty pages (and the entire book clocks in at under 250 pages), so this gives you a taste of Adichie’s style without the 600-page commitment of Americanah. If you’ve read any of Adichie’s work before, then you will notice similar themes in this collection: culture shock, the difficulties of life in Nigeria, and the complicated dynamics inherent in families. Her writing is fearless and in your face; she does not shy away from uncomfortable topics. “Cell One” (3.5/5): The narrator’s brother gets arrested for his involvement in “cult” activities (akin to Nigerian gangs) and gets sent to prison. The family visits him in prison daily, and the narrator’s opinion of him slowly changes from one of disdain (“I wanted to ask him to shut up, because he was enjoying his new role as the sufferer of indignities, and because he did not understand how lucky he was . . .”) to one of pride. “Imitation” (3/5): This story (like a few in the collection) is somewhat reminiscent of Americanah in that it highlights the clashing of two worlds: America and Nigeria. A Nigerian woman lives with her kids in Pennsylvania, while her husband (a “Big Man”) still lives in Nigeria. “A Private Experience” (4/5): A girl visiting her aunt in Kano experiences the tragic devastation of ethnic/religious (Hausa Muslim versus Igbo Christian) riots. “Ghosts” (3.5/5): A seventy-one-year-old retired professor runs into a man he assumed had been dead for decades. The chance run-in makes him feel like he has seen a ghost–a phenomenon with which he is familiar. “On Monday of Last Week” (4.5/5): This is the strongest story in the collection. It is well-written, engaging, and multi-faceted. A woman moves to America and gets a position as a nanny to a seven-year-old boy. It is, in part, a look at American parenting from the outside (“She had come to understand that American parenting was a juggling of anxieties, and that it came from having too much food: a sated belly gave Americans time to worry that their child might have a rare disease that they just read about, made them think they had the right to protect their child from disappointment and want and want and failure. A sated belly gave Americans the luxury of praising themselves for being good parents, as if caring for one’s child were the exception rather than the rule.”). But, more importantly, it is about the effects of being/feeling truly seen by someone, when you have become used to feel ignored. 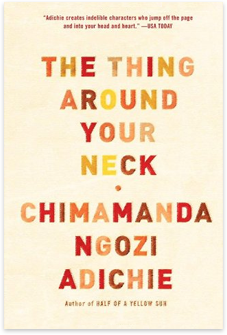 “The Thing Around Your Neck” (3/5): This is another story about the difficult transition from life in Nigeria to life in America. It is quite short and told in an interesting narrative style (second person), but feels like more of the same. “The American Embassy” (3.5/5): A woman (whose husband writes anti-government articles) goes to the American Embassy seeking an asylum visa after her son is murdered by and her husband escapes from government agents. “The Shivering” (4/5): A friendship in America is borne of tragedy in Nigeria. “The Arrangers of Marriage” (4/5): A Nigerian woman is “lucky” enough to be married off to a Nigerian man who has become a doctor in America. Not surprisingly, life in America (and with her new husband) is not what she anticipated. “Tomorrow Is Too Far” (4.5/5): This is a sad and powerful story about childhood secrets. A girl and her brother (Americans) spend the summer with their cousin at their grandmother’s house in Nigeria. Tragedy ensues. “The Headstrong Historian” (3.5/5): This is a tale that is at once cautionary and redemptive about the dangers of ignoring your culture and history. Who should read it: This book isn’t as good as Americanah. If you haven’t read Americanah, I would start there. Then, if you like Adichie’s style, come back to this later. This entry was posted in Rating: 3.5/5 and tagged Book review, Book Reviews, Books, Chimamanda Ngozi Adichie, Short stories, The Thing Around Your Neck. Bookmark the permalink. I just read this one this year – my first Adichie. There is so much to admire about her. I’m excited to hear that her novel is even better! Have you read Half of a Yellow Sun? I haven’t read HALF OF A YELLOW SUN, but it is on my TBR list. If you get around to reading AMERICANAH, let me know your thoughts!